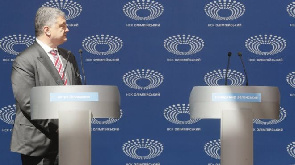 Mr Poroshenko, who is trailing his rival after winning just 16% of the first round vote, appears to now be hoping to capitalize on Mr Zelensky’s failure to arrive at Kiev’s Olympiyskiy Stadium for the televised face-off. But instead, the incumbent used his 45-minute wait at the podium to answer journalists’ questions, and attack his absent rival. Despite this, he finished the first round comfortably in the lead, garnering more than 30% of the vote, and is still favorite to win next weekend’s ballot.